A masterpiece. 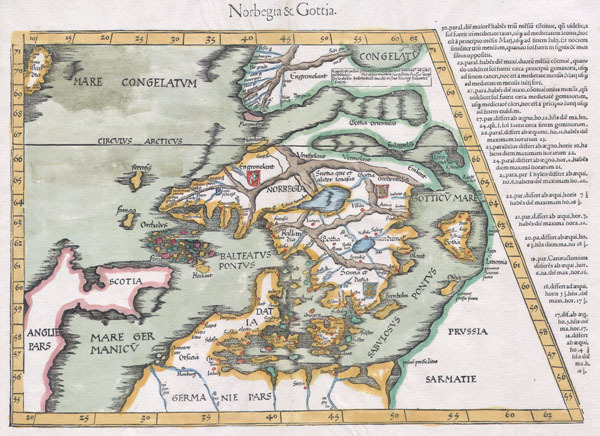 This is an important early map of Scandinavia by cartographer Martin Waldseemuller. It is heavily based on the similar map by Claudius Clavus, which appeared in the 1425 Ulm edition of Ptolemy's Geographia. The most notable difference between this edition is the addition of armorial shields for the Scandinavian countries. In this map, much of the geography is conjectural at best. Iceland, Norway, and Sweden are nearly unrecognizable. At the top of the map, Greenland appears connected to the mainland by a narrow land bridge. The text on the right describes the lengthening hours of daylight as a traveler moves north. The woodcuts for this map were prepared by Lorenzo Fries. The text was edited by Michael Servetus, who was later burned at the stake for his outspoken heresies against the Holy Land. Martin Waldseemüller (September 11, 1470 - March 16, 1520) was a German cartographer, astronomer, and mathematician credited with creating, along with Matthias Ringmann, the first map to use the name America. He was born in Wolfenweiler, near Freiburg im Breisgau. Waldseemüller studied at the University of Freiburg and, on April 25, 1507, became a member of the Gymnasium Vosagese at Saint-Dié. Martin Waldseemüller was a major exponent of theoretical or additive cartography. Unlike contemporary Portuguese and Spanish cartographers, who left maps blank where knowledge was lacking, Waldseemüller and his peers speculated based upon geographical theories to fill unknown parts of the map. His is best known for his Universalis Cosmographia a massive 12-part wall map of the world considered the first map to use the name America, today dubbed as 'America's Birth Certificate.' This map also had significance on other levels, as it combined two previously unassociated geographical styles: Ptolemaic Cartography, based on an ancient Greek model, and the emergent 'carta marina,' a type of map commonly used by European mariners in the late 15th and 16th centuries. It also extended the traditional Ptolemaic model westward to include the newly discovered continent of America, which Waldseemüller erroneously named after the person he considered most influential in its discovery, Amerigo Vespucci. When Waldseemüller died in 1520, he was a canon of the collegiate Church of Saint-Dié. In contemporary references his name is often Latinized as Martinus Ilacomylus, Ilacomilus, or Hylacomylus. Very good. Wide clean margins. Original platemark visible. Bank on verso.